“India believes in the power of balance and not the balance of power,” says M J Akbar, Minister of State for External Affairs. He was addressing the country’s business leaders at the 45the National Management Convention of All India Management Association. Akbar said that India had become the pivotal nation of the 21st century and the Prime Minister had engaged with nations across the lines. He said that the term ‘Indo-Pacific’ defined the new regional reality. However, he cautioned that if India did not have a stable government, India will not have a stable foreign policy. 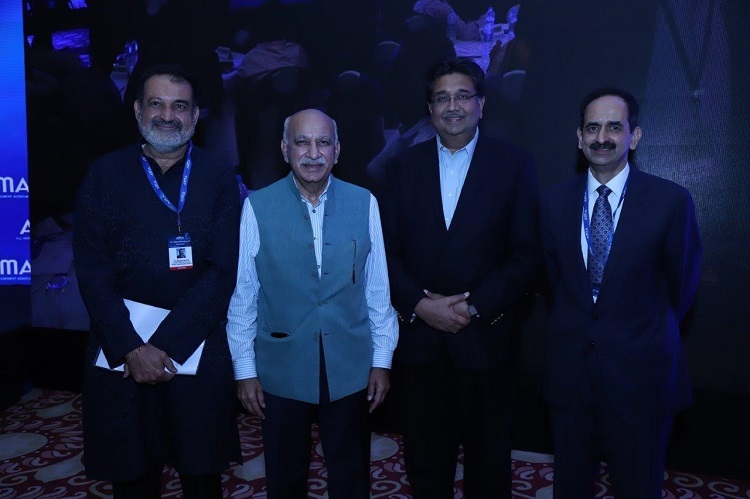 Ajay Piramal, Chairman, Piramal Group received the AIMA Managing India Business Leaders of the Year Award from the Minister. Piramal said that even in this age of disruption certain things remained constant, such as the value of trusteeship in business. Akbar also released AIMA and KPMG’s 5th Management Capability Index (MCI) for India. The index logs the strengths and weaknesses of Indian companies in 10 different areas of management. The new index involved 511 respondents from three clusters of companies – budding, rising and leading – and each category showed different strengths and concerns. The Minister presented the AIMA Kewal Nohria Award for Academic Leadership in Management Education to Dr Bhimaraya Metri, Director, IIT Trichy. In a session on the outlook for Indian economy in 2030, Baba Kalyani, Chairman and Managing Director, Bharat Forge said that India will be a middle- income economy with per capital income of $6000-$8000, up from the present $1700-1800. He said that technology will play a key role in quadrupling the per capita income. Within five years, he said, every manufacturer in India will be on the Industry 4.0 platform, like the traders are on the e-commerce platform. “One can get onto the Industry 4.0 platform without additional knowledge and become more productive,” he said, adding that the productivity and wages of workers will go up and that will drive up consumption too. He gave the example of Bharat Forge where per employee output was $150,000. Sanjiv Mehta, Chairman and Managing Director, Hindustan Unilever said that India needed to democratize debt to foster entrepreneurship. Today, he said, about 40% of the debt was cornered by big business. He argued that India could be the world’s granary if the agriculture sector was freed up. Sunil Kant Munjal, Chairman, The Hero Enterprise said that if all restrictions were removed, Indian economy could grow at a rate of 14%. “Regulatory burden is holding back the potential of the nation,” he said. Omkar Goswami, Founder and Chairperson, CERG Advisory, said that he was worried about the return of regulation in the past year and half. He also expressed concern about the momentum of economic growth if the banks stop providing cash credit to small businesses because of the NPAs of the big businesses. Kishore Biyani, Founder and Group CEO, Future Group told the convention that technology could reduce the costs of retail by 5%-6% over the next 5 years and also add value by predicting demand. He said that Future Group will form alliances and partnerships to create a new retail ecosystem. The NMC also had a live Aap Ki Adalat show with Nitin Gadkari, Minister of Road Transport & Highways, Shipping and Water Resources, River Development & Ganga Rejuvenation.